» Ken Lavigne "Let Me Be Frank!" Ken Lavigne "Let Me Be Frank!" Sat, Apr 27th, 7:30p (doors 7), Ken Lavigne – Let Me Be Frank! Let Me Be Frank! and is a revisiting of the music of the great crooners of the past. 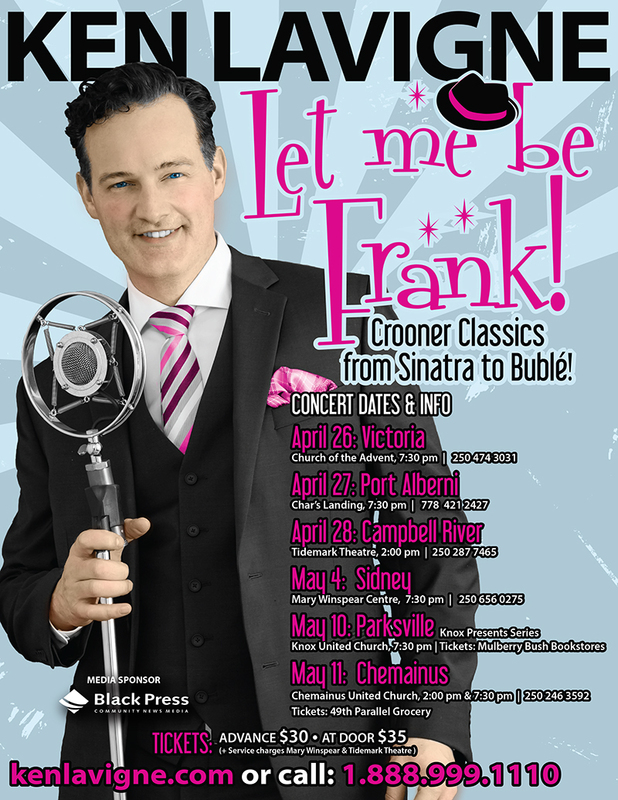 From Sinatra to Buble´ - Let Me Be Frank! is a concert celebration of the music of the great crooners of yesteryear and today. This concert features the clear, smooth vocals of Vancouver Island’s celebrated singer Ken Lavigne, accompanied his band, as he leads you through the classics of the Great American Song Book. This is a concert you won’t want to miss. All the music you know and love, performed with style! Biography Ken Lavigne is a highly acclaimed tenor who has charmed his way into the hearts of concert goers across North America with his sincere delivery of ballads, show tunes and classical crossover hits. It's easy to see why one New York critic described him as having "a voice of liquid gold" He has had the privilege of performing on many world stages from Seoul, Beijing, Shanghai to San Francisco and not to mention New York’s Carnegie Hall. He has worked with famed L.A. producer David Foster, performed for His Royal Highness Prince Charles and Queen Elizabeth II. He continues to tour extensively sharing his music and telling his story to the delight of audiences everywhere.